A useful resource for a broad spectrum of life science teachers, the 9,000-member National Association of Biology Teachers (NABT) is committed to empowering "educators to provide the best possible biology and life science education for all students." 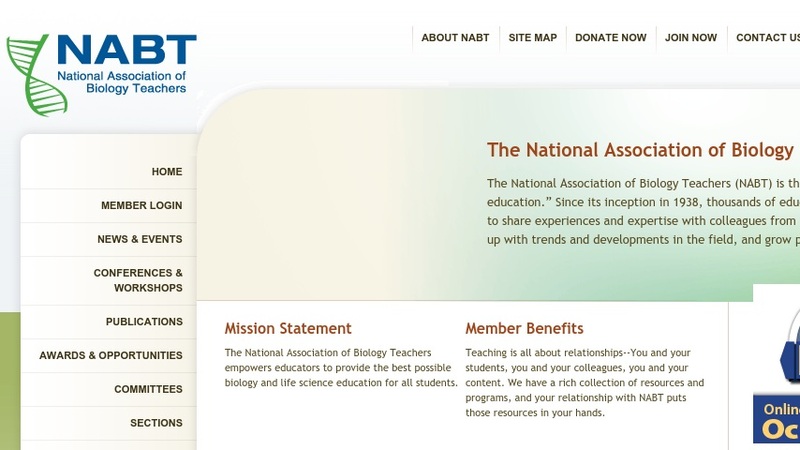 The extensive NABT website contains sections for membership, news and events, conferences and workshops, publications, and various educational resources. The siteï¿½s Education & Professional Development section includes subsections for grants, awards, volunteer opportunities, and field test opportunities. The website also contains a great selection of annotated online resources organized into categories like Ecology, Marine Mammals, Evolution, Bioethics, Neuroscience, and many more. Downloadable forms and information about the upcoming 2004 Convention in Chicago are available as well.